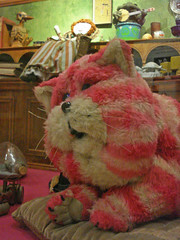 I have a sketchy memory of Bagpuss. I know I enjoyed it as a child, but when I was challenged to write a blog on it I confess I had to retreat to Wikipedia and Youtube to help refresh my memory. I don’t know how much information and which experiences I’ve forgotten because of the passage of time – and how much I have forgotten because it is so easy to access information today. My daughter remembers things because of the instant access to photographs that she has. We now have the ability to keep the events we want to alive and vivid, by replaying them again and again, whilst deprioritising memories that we know we can access through other means (Wikipedia etc). Since the time of Bagpuss the value and nature of knowledge has changed. The nature of education is therefore inextricably altered for all time. For those of us lucky enough to live through this period it is a thrilling rollercoaster of change, but it is my daughter’s generation that will be the first to be genuinely be able to make sense of and use of the technology to its fullest. This is a brave and counterintuitive new world. The smart people aren’t the ones who know Latin. The smart people are the one’s who know they can go and learn other things and gain new experiences – because Google translate can take care of the rest. We are our own personal librarians, the challenge is to index – not to read and remember. I remembered Bagpuss as being lazy. At the start of every episode we see a shop. Everything is static, the episode opens with Bagpuss giving a big yawn. Lazy. Except that Bagpuss waking up is the key for everything to shift from black and white to colour and for things to start moving. Everything comes to life when Bapguss wakes up, Bagpuss is the instigator. Bagpuss is an energiser. He may be relaxed, but others follow his prompting and intent. Be a Bagpuss. Bring colour and stories to those around you – in the office and out. It isn’t about you being the life of the party – sometimes it is just enough to have soul.